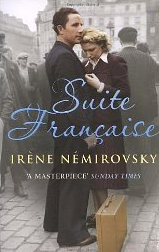 Suite Francaise by Irène Némirovsky – Review. This book has received critical literary acclaim as a masterpiece. The author gently captures the tragedy of war-time France, the conquered and the conquerors, and exposes the inner hearts and minds of the people in a way that is totally convincing. Daily emotional life is described in detail. The social upheaval of war is made worse by the sudden invasion and escape from bombing. The plight of the refugees, their panicky exodus from Paris – villages invaded by exhausted hungry women and children battling to find a place to sleep, cars abandoned after running out of petrol. In the midst of this horror and turmoil of disorder, we see simple dignity of a modest couple searching for their lost son as well as greedy people trying to save their valuables and the murderous evil of the mob. Posted on 2nd September 2011 Author editor18Categories Novel, The artsTags Auschwitz, bully, charitable heart, collaboration, divine providence, ethical dilemmas, evil of the mob, faithfulness, hate, hatred, humbling experience, hypocrisy, Jew, Nemirovsky, nobility of spirit, social disorder, subversion, Suite Francaise, survival, suspicion, treachery, violation, war-time FranceLeave a comment on Suite Francaise by Irène Némirovsky – Review.